Ordered for the Russian Navy. The N J Fjord was spotted by the Elbing at 15:00. Fire was opened at 15:30 and a hit on HMS Galatea registered at 15:32. 16:32 after turning north with Frankfurt and Pillau, Elbing engaged the Engadine&apos;s seaplane, piloted byFrederick Rutland.18:30 Elbing fired on HMS Chester scoring several hits. She and the Frankfurt launched torpedoes at Invincible after the latter had been shelling Wiesbaden. Neither hit. 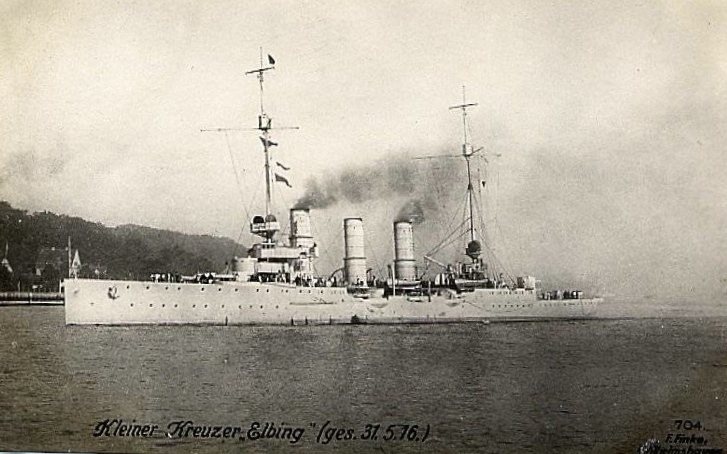 23:15 Together with the Hamburg, Elbing used British recognition signal to close in on HMS Castor. The latter launched a torpedo at Elbing which went underneath. The british 2nd Light Cruiser Squadron arrived with Commodore Goodenough on the Southampton. In the fight Elbing was hit. Wireless tranmissions were cut and 4 men killed and 12 wounded. Elbing was later rammed by another German ship, the Posen. The rip in her side caused engine room flooding and disabled her electrics. She started to list 18 degrees. Elbng&apos;s crew of 477 were taken off by a torpedo boat (S.53) at around 02:00 on 1st June 1916 and after approx. one hour she was scuttled and the remaining crew picked up by a dutch trawler. 2 steam turbines powered by 6 Yarrow coal fired steam boilers supporting 2 11&apos; shafts giving 30,000 shp.